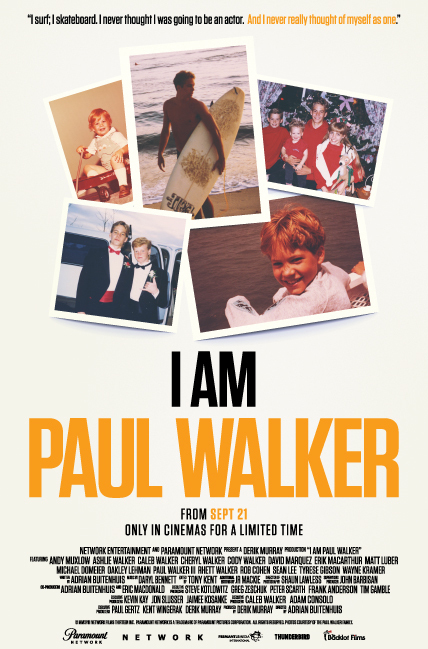 Using interviews, home movies and news footage, I Am Paul Walker pieces together the life and career of actor Paul Walker, best known for playing Brian O'Connor in several instalments of the Fast and Furious franchise. That role brought Walker success and legions of adoring fans across the globe. Walker's life was cut tragically short when in 2013 he was killed in a car accident. He was just 40. The film begins with Walker's parents, siblings and friends recounting his early years. Born into a family of veterans, sports people and adventure-seekers, Walker's California upbringing is related and we hear of camping trips, days at the beach and time spent with friends and family. We also learn about Walker's first steps in front of the camera. Good looking and charismatic, Walker was made for the spotlight, and it was his mother who set him on the path of an acting career. She got him started with auditions that led to commercials and television work. But by the time Walker was ready to leave home, he was torn between attending university and continuing acting work. It was the beginning of a long struggle. Walker was most at home when surfing, fishing or exploring remote corners of the globe - acting was never really a love for him. This becomes a key theme of the documentary and is discussed thoughtfully, especially in relation to Walker's success with the Fast and Furious films. For many other aspects of Walker's life, the film is not nearly as comprehensive. Much of his life, particularly his personal life, is glossed over, notably his relationship with the mother of his daughter and the upbringing of his daughter. Nothing is allowed to get in the way of the loving tribute to Walker, leaving a slightly disingenuous feeling. Walker genuinely was an interesting guy - anyone not swept up in the seduction of fame usually is. His death was untimely and tragic. His philanthropic work and his very loving attitude towards friends and family were also entirely commendable. And the parts of the film exploring these areas are solid. But you can't help but feel you're not getting the entire story. One for fans.